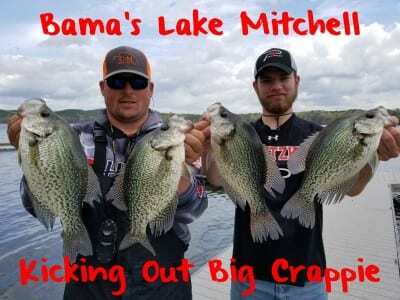 Fall fishing on the Alabama River can be the most productive time of the year for big crappie. It’s common to catch fish up to two pounds and even larger this time of year. In recent weeks the recipe for success has happened. Basically, water temperatures on the Alabama River and its tributaries have started to cool down. 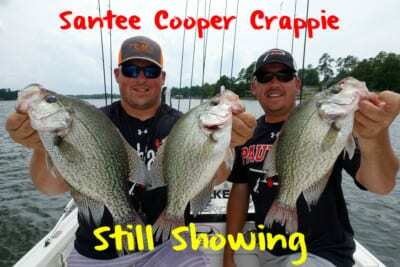 Now that the water has fallen into the 60s we are seeing crappie become more active. Fall is my favorite time of year to fish. With many anglers participating in hunting season the river is a lot less crowded. It’s a similar pattern to the spring when the crappie stage to spawn. 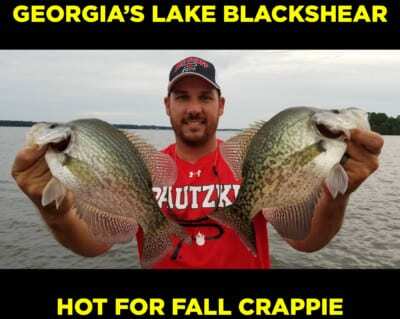 Just like in the spring, in the fall crappie stage on stumps and brush near the creek and main channel ledges. 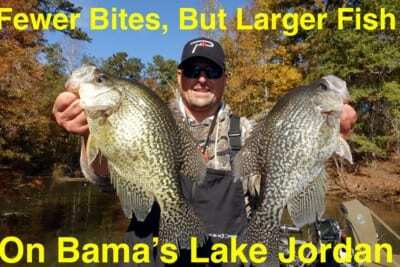 Right now crappie are structure oriented and anywhere from six to 15 feet deep. We are catching some on six-foot stumps and others on stumps in 15 feet of water. In the fall we are catching most of our crappie single pole jigging. I’m using an 11-foot Hurricane Howard jigging rod with a 1/8 ounce Pro Built jig head tipped with a live Chartreuse Fire Dye minnow. I have an entire cooler full of Fire Dye minnows every morning. I think the chartreuse minnows keep working because it’s something the crappie haven’t seen before. My partner Wade (McDonald) and I might be the only ones using them, but they are pounding them. We won’t have to worry about this until December most likely, but when the water temperature gets even cooler the shad move into the creek channels. This happens when water gets into the 50s and high 40s. Once the shad move into the channels and the crappie follow we change tactics. When this happens and crappie suspend in the river channel chasing shad some people long line and others spider rig troll. Regardless, we are still using chartreuse minnows on all our jigs. The above techniques can be used anywhere on the Alabama River from Wetumpka to Mobile Bay. The key to our success is actually finding the fish before we catch them. We do this with our Hummingbird Side View depth finder. We are scanning the creek and river edges with the finder to locate brush and stumps that these crappie are staging on. Our hummingbird units allow us to eliminate lots of water. Editor’s Note: Eric Cagle operates C&M Guide Service. 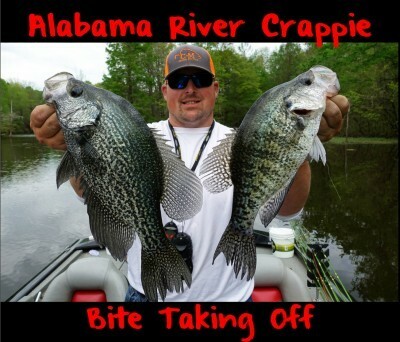 For more info on their guided Alabama River crappie trips please visit https://www.facebook.com/cagleandmcdonald.